Nice little article in The Vancouver Sun about the previously mentioned Taboo absinthe from Okanagan Spirits. I liked the comparison made when they tried to get shelf space at the government run liquor store. The "tiny absinthe allotment" was filled by a Czechoslovakian brand that was "about as similar to the subtle Taboo as, say, Baby Duck is to vintage champagne". Even that is probably being too kind! I think we have to speed our efforts at getting a bottle. It is romantic, poetic, a little bit dangerous. It is also delicious, at least when the absinthe in question is the Taboo from Okanagan Spirits. This article, showing up in The Seattle Times, shows some of the good and some of the bad that comes from the mainstream press when talking about absinthe. 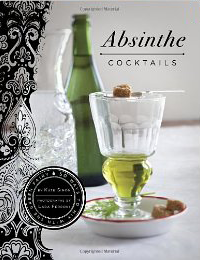 Yes, we do count ourselves as having "an extraordinary passion for [absinthe].". I'm not sure how Prof. Fugelsang could possibly say that it isn't "particularly flavorful" and "can be very bitter", unless he's in the habit of drinking nothing but pretend absinthes from the Czech region! 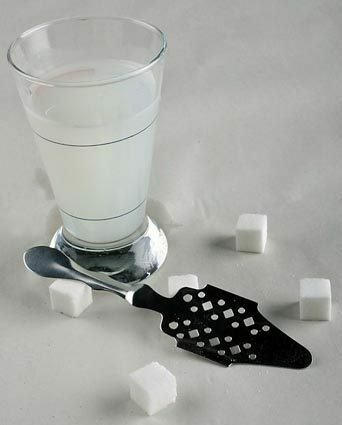 And it perpetuates the annoying myth that burning a sugar cube is somehow a "traditional" way of drinking absinthe. And then some playwright swoons over the "theater" of "when you burn something, it just looks illegal.". It is more than that, it is stupid, dangerous and ruins a good absinthe. But it has a nice segue into absinthe history, and any article that prominently mentions The Wormwood Society can't be all wrong. They do finish up with a reasonable description of making an absinthe, although the proportions (5-7 to 1) are a little too much (we like 3 or 4 to one here). But we don't notice a "sagey smell", but maybe we have tried Lucid enough. Caught on tape - Louche! 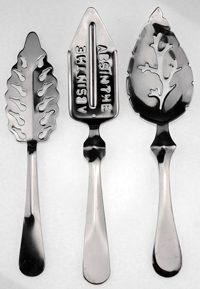 The Wormwood Society's excellent page on how to prepare absinthe has just been updated to include a video by user "Meatwaggon". While the look is grainy, it's still a nice video of a Jade PF1901 louche, all set to Chopin's Nocturne in D-flat Major. A birthday order of absinthe from Liqueurs de France arrived here at In Absinthia, and what a nice gift it was indeed! Two bottles from the Swiss distiller, Matter-LuginbÃ¼hl and one from Emile Pernot. From Pernot comes Un Emile 68 La Blanche, as you always need a Swiss blanche in every order - I think it may be a law or something... And from Matter-LuginbÃ¼hl comes Gwydion's recipe, Absinthe Marteau Verte Classique, a Suisse verte, as well as the award-winning Absinthe Duplais , another verte absinthe. Included in the order were two molded Pontarlier glass, as our previous absinthe glass went the way of many other breakable items here. We usually shy away from anything but a clear glass, no matter what the cocktail is, but these promised to be pretty as well as functional. Total cost, including shipping by the legendary "flying monkeys" was about US$245. To cut costs a bit, we went with smaller bottles, although given the hefty shipping charge, it is probably a false economy. After the break is a pictorial essay of the grand box opening, which was about a week after ordering it. 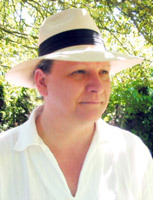 We recently had a chance to conduct an email interview with Gwydion Stone, founder of The Wormwood Society, a leading proponent of accurate absinthe information, and administrator (as 'Hiram') of its lively and informative forums. Named one of Imbibe magazine's 15 innovators of the cocktail world in 2007, he recently became involved in his own brand of absinthe, Marteau (look for a review here soon). InAbsinthia: When did you begin the Wormwood Society? GS: Our first gathering was four years ago on February 20th, 2004. About a dozen locals got together at the Capitol Club in Seattle to discuss the possibilities for an absinthe special interest group, just to host parties. We had our first Green Hour several weeks later and I went from having tasted two absinthes to seventeen. InAbsinthia: How many estimated 'active' members of the forums would you say there were? GS: It's difficult to say because people come and go of course, but we generally have around a hundred fairly active contributors, maybe fifty more who stop in regularly but less often, and a good solid core group of about thirty. InAbsinthia: What do you see as the future of the Wormwood Society and its web site? GS: The Wormwood Society is, and I believe always will be, the primary and most user-friendly source of absinthe education in America; and it's the only organization specifically dedicated to that goal. With the current changes in the US, we have a lot to keep up with, and the information is often challenging to get at, but I think the general public needs to be informed about the facts. The Wormwood Society is more than a passive web site and a discussion forum for enthusiasts; it's a pro-active educational effort. The support team members and myself often go out to other forums and blogs and attempt to clarify the facts, with varying degrees of gratitude and acceptance. I regularly write to journalists and editors and give them facts and copies of recent science papers. For the future, there are plans in the works for literature to be distributed to industry membersâ€”restaurant and bar owners, bar staff, event coordinators and state liquor control boards, as well as distillers and distributors. I'd also like to do live seminars on absinthe service for industry members. This year we'll host our first annual event, the Grande SoirÃ©e d'Absinthe, in New Orleans at Tales of the Cocktail, which is one of the largest and most well respected cocktail events in the country. The SoirÃ©e is being co-produced by the Wormwood Society and the New Orleans Culinary and Cultural Preservation Society. Absinthe and New Orleansâ€”it's a no-brainer. I expect this to become our flagship event. There's also a much-delayed podcast in the works. When I announced last summer that I was producing Marteau in Switzerland and hoped to bring it into the US this year, I didn't realize that I would have an opportunity to actually produce it here. Getting that moving takes up most of my time these days. 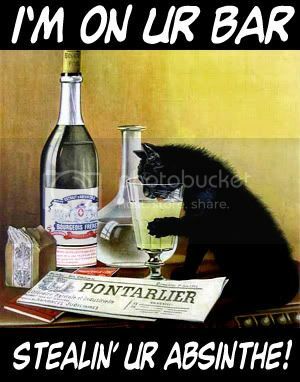 Here's a little Hump Day humor for you - an absinthe LOLcat. Epicurious, a top notch "foodie" blog, has recently run some taste tests on three new absinthes - Kubler, lucid and Mansinthe (sic). We recently reviewed lucid ourselves, and should have a Kubler review up soon. But, from the sound of it, we will probably stay away from Mansinthe, Marilyn Manson's named brand of absinthe. We don't generally run to the nearest source of "swamp water". Absinthe Taste Test Part 1: Lucid - Their review panel opinions of lucid seems to match up pretty well with ours, if maybe even a little harsher (not sure we used "armpit" in our description!). But the end result of "it's going to have to improve its flavor to stay on top" is right in line with our thinking. Of course, it was only "on top" because it was the only one available at the time. Absinthe Taste Test Part 2: Kubler - while we haven't written up an official review here at InAbsinthia, our feelings very much are, once again, right in line with the epicurious review panel. A very nice, smooth, blanche, we really have enjoyed it, especially at the price. Absinthe Taste Test Part 3: Mansinthe (Marilyn Manson Absinthe) - the stuff sounds bad, doesn't it? Reminds us of humorist H. Allen Smith's reaction to tasting his first American beer - "Put it back in the horse!" From the Great White North comes Taboo Absinthe, a blanche with the added flavoring of star anise (in addition to the more traditional green anise). The moniker is a little annoying to those of us fighting the good fight against absinthe's "bad boy" image, but perhaps the taste can overcome the image. It can even be ordered online, so you can be sure a bottle will soon be winging its way to us here at InAbsinthia! 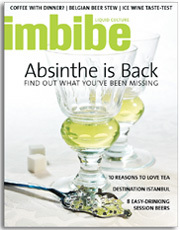 The cover story for the Jan/Feb issued of Imbibe magazine is absinthe - "Absinthe is Back: Find Out What You've Been Missing". We're still waiting for our copy to show up here at InAbsinthia, but in the meantime, be sure to click the "Take a Peek Inside" link for more info on this cool new magazine. 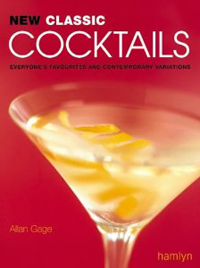 The author is Paul Clarke, whose Cocktail Chronicles blog is a regular stop of all imbibers. The article has been getting good reviews on the Wormwood Society forums, and not just because they are prominently mentioned inside! Perhaps there is still hope for truly fair and balanced coverage of our controversial green fairy. This is a pretty wacky page about absinthe. It is what The Onion would write if it told the story of absinthe. Some pretty funny stuff, and, unfortunately, for all its satire, the information here shows up too often in the mainstream press. Absinthe is distilled from bits of wood, worms, green crayons, 11 secret herbs and spices according to a secret lesbian recipe.